With the SeeMyListings.com Widget you can place your listings on your Facebook profile page. NAR has created a listing widget to place your listings on your Facebook profile. The process is very simple. 2: Click on “Add My Listings”. 3: If you are not logged into Facebook, you will be asked to login. 4: You will not get the “Allow Access” screen. 5: Click “Allow” to allow seemylistings.com to install the widget to your Facebook profile. 6: Enter your MLS provider and MLS Agent ID#. 7: Click the “Continue” button. 9: Click on “Add to Profile” and your listings will be added to your profile. 10: That’s it, you are done! 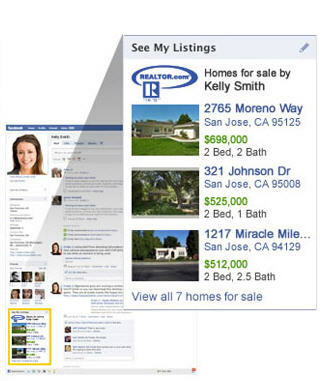 In under 10 minutes you can easily display your REALTOR.com listings to your Facebook profile. The best part of it is that your listings are automatically updated. If someone clicks on a listings they are taken to the listing detail page on REALTOR.com. For those Agents who are looking for a more branded solution and one that does not click out to REALTOR.com, thus exposing your buyer to other agents, RE/Advantage is working on a widget to allow any Agent Central Max client to have a custom branded widget on their Facebook page which clicks out to your own website. If you would like more information please contact us and we will keep you posted. Good luck if you give this a try and let me know how you did. Send me your Facebook page and maybe I will share your page on my follow-up post. Next postWhy Should You Upgrade to IDX 3.0? Thank you for these clear & concise instructions for agents. Is there a way of getting all brokerage listings on a brokerage FB fan page? how do I post my co listings along with my listings on facebook via “seemylistings” through nar?